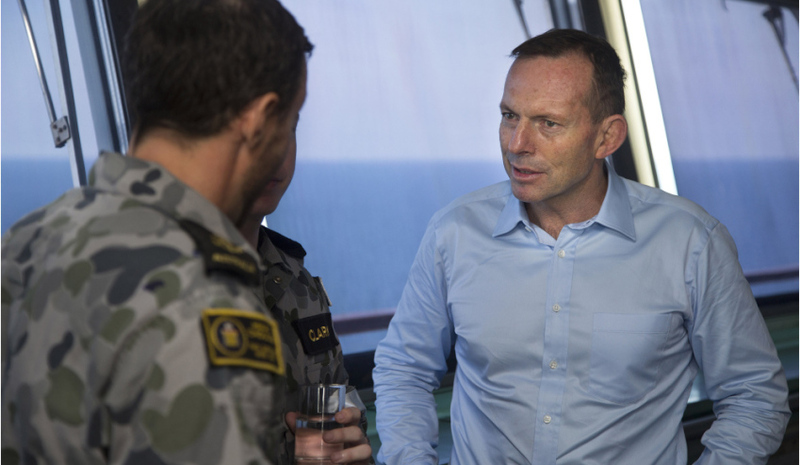 Tony Abbott chatting to sailors from HMAS Choules during Exercise Talisman Sabre 2015. Australia risks an exact repetition of the Collins Class submarine debacle, says former prime minister Tony Abbott, expressing regret over not considering off-the-shelf nuclear propelled submarines while he was prime minister. At a speech in Sydney on Thursday, Abbott called on Australia to embrace nuclear submarines and raised concerns over not having replacement subs until the 2030s. Abbott said Australia will be relying on the naval procurement process to go exactly to plan, an unlikely scenario, if it hopes to have any vessels that can rival what other regional powers like Russia and China are expanding with. "As things stand, if all goes well, the first of the new subs will take seven years to design, seven years to build and perhaps two further years to bring into service," Abbott said. "If everything goes to plan (and it very rarely does in naval procurement) the absolute soonest we could get the first of our new subs is the early-2030s – to replace the Collins Class subs that were originally supposed to start leaving service in the mid-2020s. "The Collins Class was designed in the 1980s, built in the 1990s, and then extensively modified and rebuilt in the noughties so that what was a very-good-sub-on-its-day could much more reliably take to sea. "As things stand, the Collins will need to be upgraded and modernised again while we plan for its replacement. "The whole point of the next submarine acquisition was to avoid the problems of the Collins – to find the submarine that could be brought swiftly into service with the least possible modifications – but what we have done so far risks an exact repetition." Abbott also took indirect aim at Prime Minister Malcolm Turnbull and Minister for Defence Industy Christopher Pyne's ambitious plans for domestic shipbuilding, arguing that it risks a big "cost penalty" for the Australian Defence Force. "We’ve based our proposed sub on an existing design, but one that will need to be so extensively reworked that it’s effectively a brand new submarine and our intention is to build it entirely in Australia," said Abbott. "Although surface ships can be cost-effectively produced here on a continuous build basis, the primary object of defence procurement has to be the most effective armed forces – not domestic job creation. "We don’t build our jet fighters here, for instance, (although we do build parts for them) so why insist on a local build especially if there’s a big cost penalty?" The former PM said despite Australia looking to avoid procuring a uniquely Australian vessel, the result of the procurement process and decisions thereafter has delivered exactly that. "A unique Australian boat is precisely what we wanted to avoid; but it’s exactly what we now face because of our insistence on a submarine that, as well as being large, and long-range, was also conventionally powered," Abbott said. "The competitive evaluation process conclusively showed that there’s no such thing currently in existence. "All the submarines on which the bids were based are excellent for their countries’ needs – but none, it seems, for ours. "The Japanese sub lacked range. "The German sub lacked size. "And the French sub lacked conventional power." Abbott said this decision would be déjà vu for those who have seen the problems with the Collins Class submarines unfold over the years since its procurement in the 1980s. "Instead of changing what we wanted, we’ve decided – again – to bring an orphan submarine into being," he said. "Instead of taking a small Swedish submarine designed for the Baltic and seeking to double its size and range to make it suitable for the Pacific – as with the Collins – this time we’re proposing to take a French nuclear submarine and completely redesign it to work with conventional propulsion." Abbott, who publicly backed Japan's bid for the $50 billion project while he was prime minister, noted the government has been too fearful to ask the question about nuclear submarine capability, but must consider it. "It’s worth noting that Australia has not made a formal decision against acquiring nuclear-powered submarines; so much as studiously avoided even asking the question," he said. "I’m not saying that we must go nuclear, but surely we should at least consider the option before the opportunity is lost for another several decades. "The French-based design is hardly begun, let alone finalised. No contract to build has been signed and won’t be for years. "This is because it’s a completely new sub – inspired by, rather based on the existing nuclear model – that needs to be designed from scratch rather than simply modified to take a different engine. "So there is still a chance for further thought on this; there may even be a duty to consider 'plan b' should the design process be further delayed or should regional tensions show little sign of abating." The former prime minister suggested any Australian nuclear-powered submarines could temporarily be based at the US base in Guam while Australia builds up its own nuclear waste capabilities, which are currently limited to just one reactor in Sydney. "Creating a nuclear industry to service subs here would take a decade, perhaps more, yet might turn out to be a lesser challenge than designing and building a new class of submarine almost from scratch," Abbott said. "Within the 15-plus years that it’s currently planned to take to get even the first of our new conventional subs into service, we could develop a nuclear servicing capability – and if we were to buy or lease a US submarine it could initially be supported at the American bases in Guam and Hawaii. "In the 1960s, we relatively swiftly developed a civilian nuclear capacity, mainly for medicine, centred on the Lucas Heights facility in Sydney; so it can be done if the will is there." Abbott, who stressed he did "not want to interrupt the process of acquiring new submarine", attributed the need for nuclear submarines as an important step if Australia hopes to remain strong in the region. "Our region is building more and bigger submarines," he said. "Indonesia has two with three more coming. Singapore has four with four more coming. Vietnam has six and Korea has 14. "Japan has 19 advanced conventional subs. "India has two ballistic missile subs, one nuclear powered attack sub and 13 conventional subs with six more coming. "The Russian Pacific Fleet reportedly has five ballistic missile subs, 10 nuclear powered attack subs and eight conventional subs. "Then there’s China with four ballistic missile subs, five nuclear powered attack subs and over 50 conventional subs with more and more coming all the time. "Our new subs are supposed to be 'regionally superior' – including, presumably, to the sharply increasing numbers of nuclear-powered attack submarines that are based in our region."